INCEPTION: Mind Over Reality- In IMAX! The dream state of the mind, some people and psychics think, delivers us into a subconscious world that is a another dimension of the real world as we know it. Ideas sometimes can be inspired through dreams. The word “dream” is also an expression of our ambitions, wants and physical desires in this world. 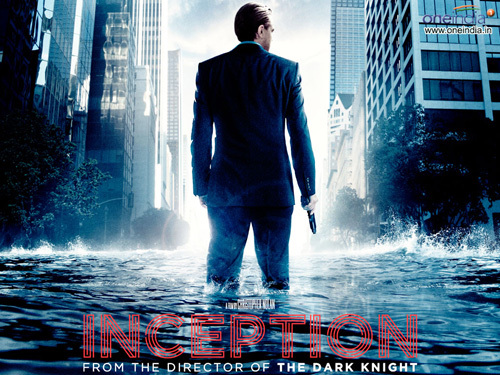 In the movie “Inception”, written and directed by Chris Nolan (The Dark Knight, Batman Begins) and starring Leonardo DiCaprio who plays “Cobb”, a team consisting of a forger and impressionist, (Tom Hardy), an architect (Ellen Page), a chemist (Dileep Rao), and a master ring-leader thief/extractor (DiCaprio) with his assistant, Arthur (Joseph Gordon-Levitt) propagate the ultimate “dream” job that would resolve Cobb’s legal issues that prevent him from entering back to his home and reuniting with his children. Cobb is hired by a powerful leader, Saito (Ken Watanabe) of an enterprise to plant an idea into the soon-to-be heir of his father’s competing business via a heavily-induced dream state. Once the idea is planted, it would allow Saito’s own enterprise to dominate. The tricky part, where does an idea start? How to plant a seed into the mind for which it will grow on its own. “Inception” explores these levels of subconsciousness as we also see the interior into the mind of Cobb which brings to his plan, unavoidable consequences. The underlying themes of the film focuses on family relationships. That between a son and his father; a Husband and Wife; and a parent and child. The film is full of mind-challenging scenarios where nothing is what it seems to be. The cast ensemble of actors interlock into perfect sync to deliver an original and fascinating non-stop adventure. Viewers of this film will ride the IMAX blast to a heightened consciousness. The most exciting part of “Inception” is how it ends which, combined with the subject matter and strength and complexity of the characters, a new franchise series of “Inception” films could very well be on the horizon!